Ongoing education program “Digging Up the Past, the Archaeological Experience.” Students participate in an outdoor simulated archaeological dig and are taught basic excavation techniques, recording procedures, and how archaeologists uncover clues about the past. 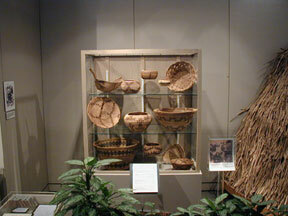 In the Museum?s classroom, students identify artifacts and develop historical connections. The Archaeological Experience is 2.5 hours in length (9:30 am to 12 noon) and is limited to a maximum of 35 students, grades 4-8. Reservations are necessary. Cost: $250 per class group, 35 student maximum. Open daily from 10 a.m. to 5 p.m.